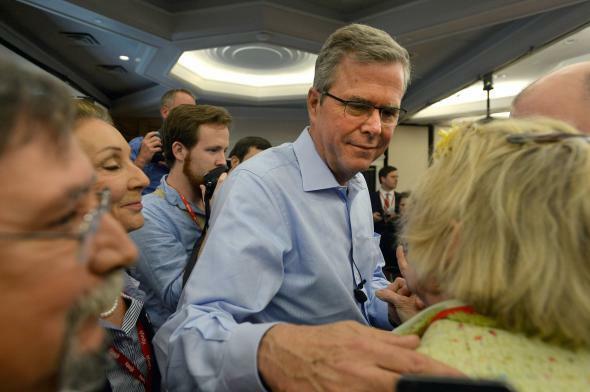 Jeb Bush, the undecider-in-chief: How the GOP hopeful is making a mockery of our campaign finance system. In his final show as host of Face the Nation, CBS News’ Bob Schieffer did his best to cut through the BS on Sunday. Jeb Bush did his best to shovel it right back on. It’s painfully obvious that Bush is lying. His actions over the past six months make it clear he is a presidential candidate by any definition besides his own (and even sometimes including his own: He once slipped up and said “I’m running for president in 2016”). Since officially launching an exploratory committee in December to test the waters, Bush has spent nearly every day cannonballing into the same campaign pool. He has held meet-and-greets and town halls in early nominating states, appeared at a growing number of candidate forums, sat down with influential interest groups, been a regular on cable news, hired campaign staff, and raised a truly massive amount of cash for a presidential run. He and his team have even reportedly gone as far as to lobby Nevada officials to change their current nominating contest from a caucus to a primary to increase his chances of scoring a victory there next year. It’s not just an issue of semantics, either. Every day Bush pretends not to be running for president is another day he can personally ask wealthy donors to cut six- and seven-figure checks to the super PAC that will run point for his White House bid. Bush is, of course, not alone in playing fast and loose with electoral rules for his own financial advantage. Campaign watchdogs like the Campaign Legal Center have also called out Scott Walker and a handful of other GOP hopefuls who have similarly delayed their announcements, but given the sheer size and scope of Bush’s campaign-by-any-other-name, he’s in a class of his own.